FIRSTLY, LET’S AVOID ANY CONFUSION, the kind of confusion that can only be created by internet searching. 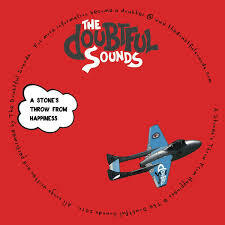 This Doubtful Sounds are the indie band that haven’t forgotten that the 1980s were the finest musical decade since the 1970s; the other act by the same name is a choral group led by Radio New Zealand’s Bryan Crump. Sure, you would never get them mixed up standing side by side, but in netland, who knows. The Sounds have been throwing singles at me for about 18 months now, CDs that I’ve enjoyed and made me hope for an album. Here it is, their second in fact, following 2012’s The Pop Album, which I am hoping they will send this way as part of the bribe for reviewing this. The men behind this motley crew are Matt Carte and James Noble with Rick Barr and Mark Howden helping out. It begins with the resoundingly poppy Painting By Numbers, all harmonies, Primitives-style guitars, melodies, and a fantastic chorus. The kind of song for a summer barbie on the beach with Miss Guam on your arm. She’s The Bomb is an ideal love song, the eye-catching subject being too good to believe: “She’s a Monet in a perfect room/ She’s the flower and she’s the bloom,” and there’s another 15 lines of similar fawning praise. He Came From The Hills and Precious Thing are more languid affairs, dreamy and effervescent, landscapes of bountiful beautiful tunes. The latter, in particular, makes me pine for the Soup Dragons and the Pastels (go look ‘em up). The Doubtful Sounds may be a tag team from Auckland and Wellington, rather than Glasgow, but the love of Love and The Byrds transcends national boundaries and long-haul flights with an inadequate menu. I mentioned The Primitives there, and by golly, they also have an album out, Spin-O-Rama which I will review in the very near future. And to avoid any confusion here are the Doubtful Sounds as conducted by Bryan Crump ..